We now move to the third “stance” in Christian Martial Arts – “be brave” (ἀνδρίζεσθε). The word “brave” (andrizesthe) means “to make a man.” It’s the present imperative middle in the Greek and means God expects Christians to conduct themselves in a manly or courageous way. Aristotle used the word to indicate someone who displayed courage between fear and confidence. That’s a good description of what it means to defend yourself against a sudden and vicious attack. To feel fear is normal when you’re attacked, but the training we undergo as martial artists also builds confidence so we can quickly rise to the need to be brave and defend against the enemy. In martial arts training students move from “awareness” (Stance 1) to “on-guard” (Stance 2) to “self defense” (Stance 3). As we Yield to oncoming force and Clear our midline from the direction of the attack, we also initiate Contact (blocking, stopping), Control (redirecting force) and Counter (striking, kicking, trapping, throwing) as one movement – like a great wave of water moving anything in it and on it to a place of least harm. Martial artists spend months and years learning many ways to stop or redirect an attack. 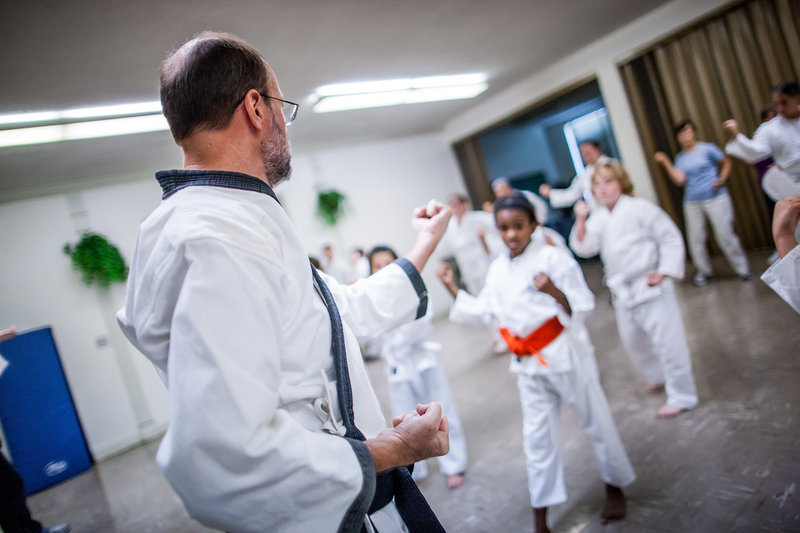 In Christian martial arts our goal is to defend bravely, efficiently, effectively and compassionately. The best defense is not to be attacked in the first place, but if we are attacked we want to escape to a place of safety. Our first lessons include learning how to escape from danger using whole body techniques. As we grow in knowledge of specific self-defense techniques we also learn how to apply them quickly and powerfully. Ending an attack before the attacker can mount a strong offense means being brave to mount a strong defense. Since attackers are usually larger, stronger and meaner, bravery is at the core of our ability to defend effectively. Christians in our country are under attack in ways we haven’t seen in a very long time. Our spiritual enemy is raising an army of hatred against God’s people that will soon demonstrate itself in physical violence that most of us have never experienced. That may be hard to believe, but if we are “aware” and “on guard” we will see the dust clouds of the enemy forces coming toward us. Even as we learn self-defense techniques and practice them so we do them quickly and effectively, so we must learn techniques of faith defense so we can speak clearly and bravely in the times of great trial that are surely coming. Let’s begin with a quick look at “being brave” from some of the great people of faith in the Bible. They are our examples of what to do in the face of great spiritual danger.